The dojins are by a circle/person known as TWO-DASH, and I admit I had not heard the name before. Assured that they didn’t contain adult-only material, I took a look at the three volumes which my brother bought. Chaos:01 is the oldest of the bunch, and it shows. The style is very nice but very rough, almost as if the pencil wasn’t completely erased when ink was put on. In any case, it’s aestethically pleasing. The story (as the dojin titles may hint at) revolves around the very famous Dark Knight flag quest, Blade of Darkness. In this case a Hume named as Yui Sofianull which happens, during the course of an investigation in Palborough Mines, to run into Zeid, the last Dark Knight remained after the Great War. What follows is basically a recap of the same quest, with Zeid giving Yui the Chaosbringer. There are some differences, in the sense that the author has brought the “Dark Knight feeds on negative emotions” paradigm to the extreme, as Yui goes berserk and slays a lot of people, including her Elvaan Paladin partner, who is shown in the picture on the left. 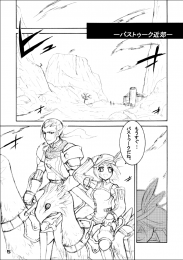 After that, she starts traveling around Vana’diel. For being a dojin, the gratuitous moments are quite minimal, which is refreshing and welcome at the same time. Story-wise, save for the dramatic events near the end, it is pretty easy to follow if you have played FFXI. Also, aside Zeid, Volker also appears as a guest in some scenes. The second dojin, Chaos: 02, appeared roughly a year after the first. In this case we see that the author’s style has quite matured, and there’s no longer that feeling of “being raw”: in general everything is much cleaner. The picture on the right already gives the story of the second volume away: it’s about mission 2-3, better known as “the dragon” among FFXI players. 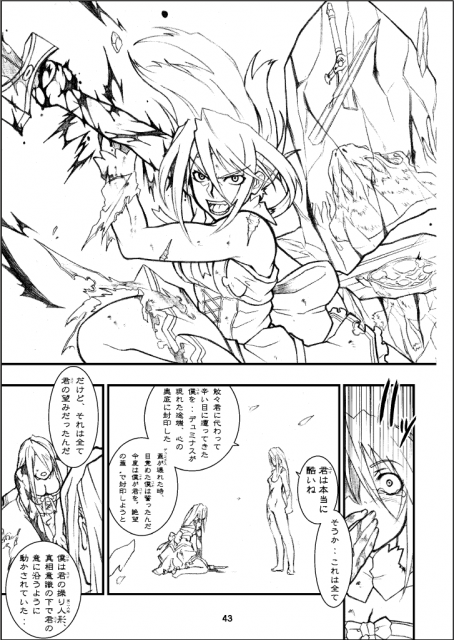 The plot shows Yui, still heavily tormented by the massacre she did in the previous volume, getting in touch with a group of Tarutarus and an Elvaan thief. The progression of the mission isn’t really like in the game (there is a traitorous Mithra involved) but the outcome is the same, and even in this case Yui manages to go berserk and slay the dragon as shown (technically she couldn’t wear Artifact Armor, but that is minor). The dojin ends shortly after that, with a “To be continued”. Unlike the first dojin, there are more risque scenes (nothing too much, luckily), and again we see some important characters in the FFXI universe such as Nanaa Mihgo. The third and last dojin for now is the most recent (2006) and the one with the best art of the bunch (not too surprisingly). It is also the one with most risque scenes (also not too many). The story here seems original, and involves Yui and a new partner, aided by a White Mage and a Beastmaster, looking up a Weapon in Delkfutt’s Tower (which ends smashed like in the picture). In the end, Yui gets detained by the Jeuno palace guards and the story is again continued on the next volume (which sadly isn’t out yet). What to say on these three dojins? I’m quite pleased overall, both because they aren’t H and because they talk about FFXI. It is a plus of course that it is a coherent story instead of small, unrelated tales like some of the (officially licensed) FFXI manga and they’re quite recommended (also given that they’re not expensive at all).